Magic Room Brand drumsticks - Made of 100% biodegradable bamboo. - Lighter than maple. Stronger than oak. - Approx. 16” long. - Available in 7A, 5A, and 5B sizes. - 2B size coming soon. - High shoulder for versatility, attack, balance, and feel. - Lacquer-free for optimal grip that improves as you play. - Comes in a reusable bamboo drawstring bag. Don’t play sticks. Play drums. Magic Room Brand’s artfully crafted and eco-friendly bamboo drumsticks are designed to let you be you - unrestricted. The lighter weight is sure to open up new grooves and possibilities, while the strength and fiber consistency will finally let your cymbals sing the way they’re supposed to. No more washy overtones. Built for the studio. Perfect for the stage. 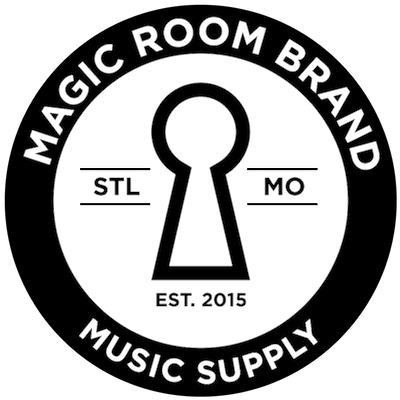 Magic Room Brand drumsticks - Made of 100% biodegradable bamboo. - Lighter than maple. Stronger than oak. - Approx. 16” long. - Available in 7A and 5B sizes. - 5A and 2B sizes coming soon. - High shoulder for versatility, attack, balance, and feel. - Lacquer-free for optimal grip that improves as you play. - Comes in a reusable bamboo drawstring bag. Don’t play sticks. Play drums. Magic Room Brand’s artfully crafted and eco-friendly bamboo drumsticks are designed to let you be you - unrestricted. The lighter weight is sure to open up new grooves and possibilities, while the strength and fiber consistency will finally let your cymbals sing the way they’re supposed to. No more washy overtones. Built for the studio. Perfect for the stage. - Drumsticks are made of 100% biodegradable bamboo. - Lighter than maple. Stronger than oak. - Approx. 16” long. - Available in 7A and 5B sizes. - 5A and 2B sizes coming soon. - High shoulder for versatility, attack, balance, and feel. - Lacquer-free for optimal grip that improves as you play. - Comes in a reusable bamboo drawstring bag. Don’t play sticks. Play drums. Magic Room Brand’s artfully crafted and eco-friendly bamboo drumsticks are designed to let you be you - unrestricted. The lighter weight is sure to open up new grooves and possibilities, while the strength and fiber consistency will finally let your cymbals sing the way they’re supposed to. No more washy overtones. Built for the studio. Perfect for the stage. - 5 guitar picks in a reusable bamboo drawstring bag. - 100% biodegradable. - Molded from bamboo cellulose (inside the stalk) and all-natural plant material. - Standard 351 shape. - Unique tapered design offers optimal grip at top (2.0mm thick ) and versatile playability at the tip (0.8mm thick). - Lacquer-free, frosted surface for optimal grip that improves as you play. Magic Room Brand eco-friendly guitar picks ensure that you no longer have to choose between warm strums and precision picking. Total versatility for all levels and styles. -- - Drumsticks are made of 100% biodegradable bamboo. - Lighter than maple. Stronger than oak. - Approx. 16” long. - Available in 7A and 5B sizes. - 5A and 2B sizes coming soon. - High shoulder for versatility, attack, balance, and feel. - Lacquer-free for optimal grip that improves as you play. - Comes in a reusable bamboo drawstring bag. Don’t play sticks. Play drums. Magic Room Brand’s artfully crafted and eco-friendly bamboo drumsticks are designed to let you be you - unrestricted. The lighter weight is sure to open up new grooves and possibilities, while the strength and fiber consistency will finally let your cymbals sing the way they’re supposed to. No more washy overtones. Built for the studio. Perfect for the stage. - 10 guitar picks in a reusable bamboo drawstring bag. - 100% biodegradable. - Molded from bamboo cellulose (inside the stalk) and all-natural plant material. - Standard 351 shape. - Unique tapered design offers optimal grip at top (2.0mm thick ) and versatile playability at the tip (0.8mm thick). - Lacquer-free, frosted surface for optimal grip that improves as you play. Magic Room Brand eco-friendly guitar picks ensure that you no longer have to choose between warm strums and precision picking. Total versatility for all levels and styles. -- - Drumsticks are made of 100% biodegradable bamboo. - Lighter than maple. Stronger than oak. - Approx. 16” long. - Available in 7A, 5A, and 5B sizes. - 2B size coming soon. - High shoulder for versatility, attack, balance, and feel. - Lacquer-free for optimal grip that improves as you play. - Comes in a reusable bamboo drawstring bag. Don’t play sticks. Play drums. Magic Room Brand’s artfully crafted and eco-friendly bamboo drumsticks are designed to let you be you - unrestricted. The lighter weight is sure to open up new grooves and possibilities, while the strength and fiber consistency will finally let your cymbals sing the way they’re supposed to. No more washy overtones. Built for the studio. Perfect for the stage. - 10 guitar picks in a reusable bamboo drawstring bag. - 100% biodegradable. - Molded from bamboo cellulose (inside the stalk) and all-natural plant material. - Standard 351 shape. - Unique tapered design offers optimal grip at top (2.0mm thick ) and versatile playability at the tip (0.8mm thick). - Lacquer-free, frosted surface for optimal grip that improves as you play. Magic Room Brand eco-friendly guitar picks ensure that you no longer have to choose between warm strums and precision picking. Total versatility for all levels and styles. -- - Drumsticks are made of 100% biodegradable bamboo. - Lighter than maple. Stronger than oak. - Approx. 16” long. - Available in 7A and 5B sizes. - 5A and 2B sizes coming soon. - High shoulder for versatility, attack, balance, and feel. - Lacquer-free for optimal grip that improves as you play. - Comes in a reusable bamboo drawstring bag. Don’t play sticks. Play drums. Magic Room Brand’s artfully crafted and eco-friendly bamboo drumsticks are designed to let you be you - unrestricted. The lighter weight is sure to open up new grooves and possibilities, while the strength and fiber consistency will finally let your cymbals sing the way they’re supposed to. No more washy overtones. Built for the studio. Perfect for the stage. - 10 guitar picks in a reusable bamboo drawstring bag. - 100% biodegradable. - Molded from bamboo cellulose (inside the stalk) and all-natural plant material. - Standard 351 shape. - Unique tapered design offers optimal grip at top (2.0mm thick ) and versatile playability at the tip (0.8mm thick). - Lacquer-free, frosted surface for optimal grip that improves as you play. Magic Room Brand eco-friendly guitar picks ensure that you no longer have to choose between warm strums and precision picking. Total versatility for all levels and styles. -- - Drumsticks are made of 100% biodegradable bamboo. - Lighter than maple. Stronger than oak. - Approx. 16” long. - Available in 7A, 5A, and 5B sizes. - 2B sizes coming soon. - High shoulder for versatility, attack, balance, and feel. - Lacquer-free for optimal grip that improves as you play. - Comes in a reusable bamboo drawstring bag. Don’t play sticks. Play drums. Magic Room Brand’s artfully crafted and eco-friendly bamboo drumsticks are designed to let you be you - unrestricted. The lighter weight is sure to open up new grooves and possibilities, while the strength and fiber consistency will finally let your cymbals sing the way they’re supposed to. No more washy overtones. Built for the studio. Perfect for the stage. - 5 guitar picks in a reusable bamboo drawstring bag. - 100% biodegradable. - Molded from bamboo cellulose (inside the stalk) and all-natural plant material. - Standard 351 shape. - Unique tapered design offers optimal grip at top (2.0mm thick ) and versatile playability at the tip (0.8mm thick). - Lacquer-free, frosted surface for optimal grip that improves as you play. Magic Room Brand eco-friendly guitar picks ensure that you no longer have to choose between warm strums and precision picking. Total versatility for all levels and styles. - 10 guitar picks in a reusable bamboo drawstring bag. - 100% biodegradable. - Molded from bamboo cellulose (inside the stalk) and all-natural plant material. - Standard 351 shape. - Unique tapered design offers optimal grip at top (2.0mm thick ) and versatile playability at the tip (0.8mm thick). - Lacquer-free, frosted surface for optimal grip that improves as you play. Magic Room Brand eco-friendly guitar picks ensure that you no longer have to choose between warm strums and precision picking. Total versatility for all levels and styles. - 5 guitar picks in a reusable bamboo drawstring bag. - 100% biodegradable. - Molded from bamboo cellulose (inside the stalk) and all-natural plant material. - Standard 351 shape. - Unique tapered design offers optimal grip at top (2.0mm thick ) and versatile playability at the tip (0.8mm thick). - Lacquer-free, frosted surface for optimal grip that improves as you play. Magic Room Brand eco-friendly guitar picks ensure that you no longer have to choose between warm strums and precision picking. Total versatility for all levels and styles. -- - Drumsticks are made of 100% biodegradable bamboo. - Lighter than maple. Stronger than oak. - Approx. 16” long. - Available in 7A, 5A, and 5B sizes. - 2B size coming soon. - High shoulder for versatility, attack, balance, and feel. - Lacquer-free for optimal grip that improves as you play. - Comes in a reusable bamboo drawstring bag. Don’t play sticks. Play drums. Magic Room Brand’s artfully crafted and eco-friendly bamboo drumsticks are designed to let you be you - unrestricted. The lighter weight is sure to open up new grooves and possibilities, while the strength and fiber consistency will finally let your cymbals sing the way they’re supposed to. No more washy overtones. Built for the studio. Perfect for the stage. - Drumsticks are made of 100% biodegradable bamboo. - Lighter than maple. Stronger than oak. - Approx. 16” long. - Available in 7A, 5A, and 5B sizes. - 2B size coming soon. - High shoulder for versatility, attack, balance, and feel. - Lacquer-free for optimal grip that improves as you play. - Comes in a reusable bamboo drawstring bag. Don’t play sticks. Play drums. Magic Room Brand’s artfully crafted and eco-friendly bamboo drumsticks are designed to let you be you - unrestricted. The lighter weight is sure to open up new grooves and possibilities, while the strength and fiber consistency will finally let your cymbals sing the way they’re supposed to. No more washy overtones. Built for the studio. Perfect for the stage.